Magnesium is a mineral that is needed by every cell of the body. Magnesium is needed for bone, protein, and fatty acid formation, making new cells, activating B vitamins, relaxing muscles, clotting blood, and forming ATP - the muscle's energy source. Some human studies have also found that magnesium supplementation helps to relieve anxiety. 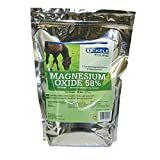 Many horse owners use magnesium to help calm their animals. Magnesium supplements for horses are available in powders, flavored pellets, and topical poultices.